An afternoon-concert of this beautiful little French school called Eclatant. We spoke with them about Christmas, France and Europe, sang Christmas songs in French and then gave our concert. After our performance, one of the teachers went to sing in a choir in front of the station and we went to see him perform in his Christmas-tree outfit. The logo is like a labyrinth, based on the owner’s name Iguchi. This labyrinth seems to represent the intricate thinking and absolutely open mindedness. The café is a cake shop, a café and a place for people to meet. We projected some of Bx’s paintings on the wall while we played. 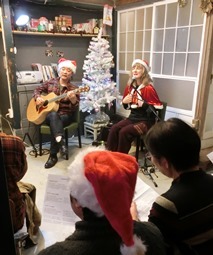 We also sang Christmas songs and spoke with the audience. At the end, a big jam… Good first time in Toyohashi. 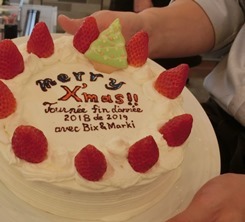 Knohd makes cakes only on reservation with messages and decorations that you can order, like this cake that they gently prepared for us. Yoko chan’s harmonica brought a color of Blues to 2 of our songs. It was the second time for him too to play with us at Café B+ which has a lovely audience and is a place open to musicians. The owners are both musicians too. We played with Miwako ’s violin which gave a more dramatic dimension to the 4 songs that we did together. The sound of the violin with our voices and harmonies made it more interactive, and Bix loved to play a flute solo together with the violin. 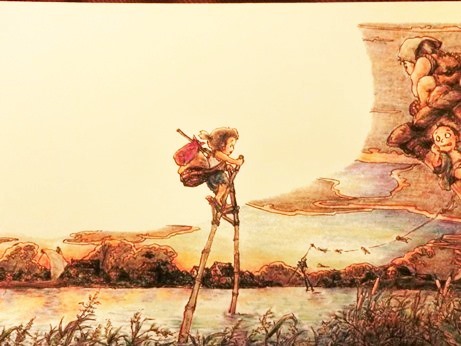 We usually play in café DUFI when we come to Nagoya and this time Tomohiro Hayashi – Richard – had prepared an exhibition of his beautiful and mysterious drawings, freely set on the walls with magnets to be moved around, the size of postcards. In this exhibition - concert the drawings and our music made us connect the pictures and the titles, the lyrics of the songs, the rhythms and the harmonies. We talked about the drawings and with Richard in between the songs. It was an eye-opening concert. Our friends from Gifrance: thank you to all of you… and to Gilles (French teacher at the university of Gifu) and his family who came to see us. 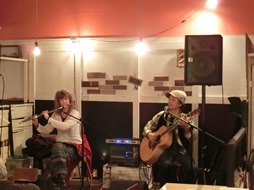 We were supposed to play in the other restaurant owned by the same owner in Gifu, called Siesta, where we had played many times before. Unfortunately the restaurant burnt down in September, due to an accidental fire. We played in Open Sesame hoping to bring new energy and support in these very hard times for them. 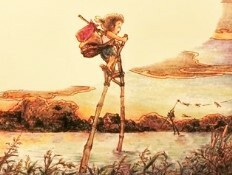 Things happen in life, and music may sometimes bring strength and consolation. Downtown Kyoto, we played in this restaurant for the first time. The sound in the space was really good. Friends came and we made friends. Thanks to the big windows, we noticed while playing that many foreign tourists were walking in the streets. 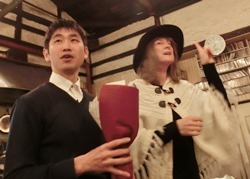 Kyoto is getting more international…we think it is in a good way. 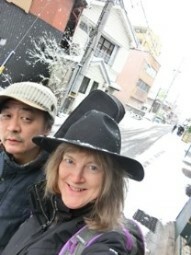 In the New Year, we went from Marki’s family home to Shiga, next to Kyoto. We played 3 songs with the owner Mr. Ooga on his guitar, this time very soft and airy. 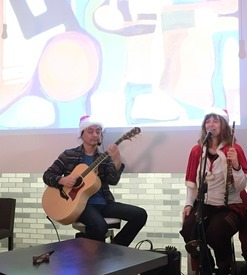 One of the songs was ours, another was a request from one of the customers who came to see us last Summer and the 3rd one a French song people know in Japanese but not in French. Also, a guitar student of Marki’s, from Kyoto, came to see us. He walked 25 min in the rice fields to reach the café. He said it was so nice. This tour was maybe more relaxing than usual but at the same time the number of people coming to our concerts seemed to have increased. Tension and release. On the road forever! Thank you so much to all of you for supporting us and see you soon again !